A Pileated Woodpecker forages on a willow tree at the Elizabethton home of Tom and Helen Stetler. I received an email recently from Tom and Helen Stetler. 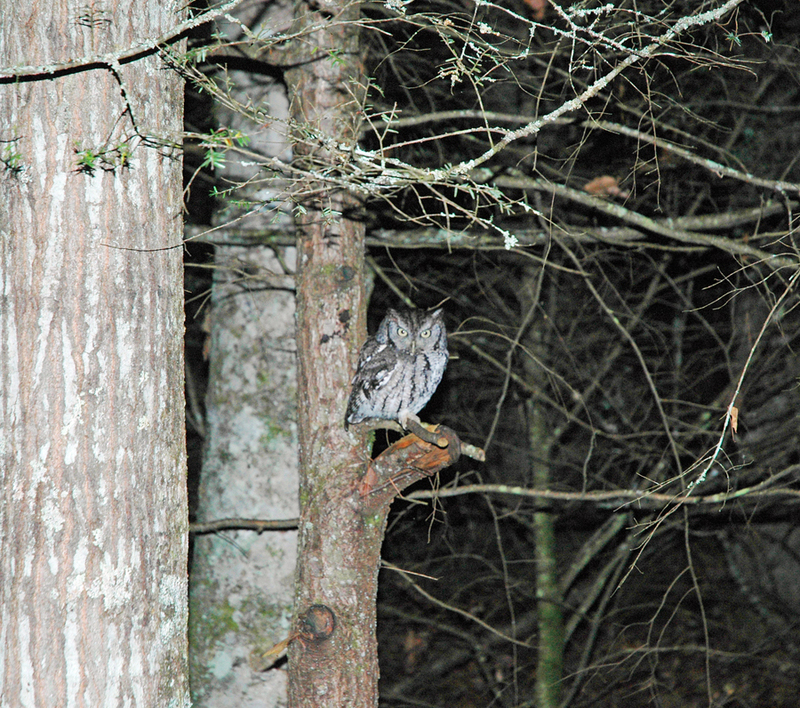 The Stetlers live in Elizabethton and often attend bird walks offered by the Elizabethton Bird Club. He added an interesting tidbit of information about Pileated Woodpeckers. “Our old-timey neighbor calls it a wood hen,” Tom wrote in the email. The Pileated Woodpecker has actually had an abundance of common names associated with it. 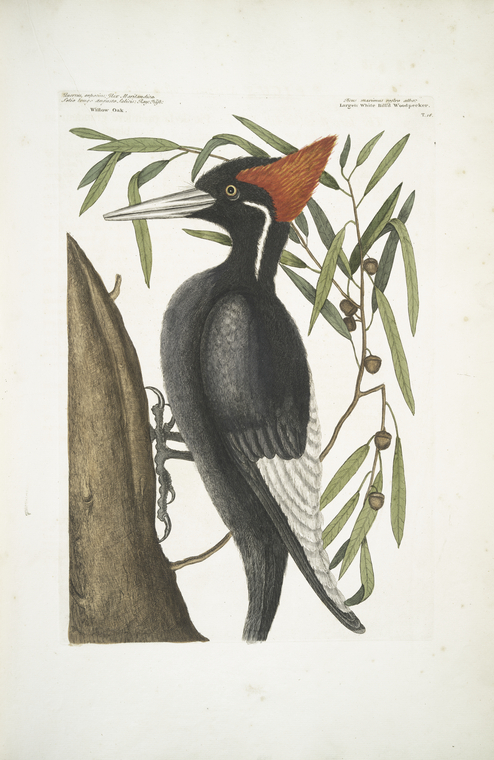 English naturalist Mark Catesby, who died in 1749, gave this large bird the name of “Large Red-crested Woodpecker.” The Swedish botanist apparently gave the woodpecker the scientific name of Dryocopus pileatus. A painting of an Ivory-billed Woodpecker by Mark Catesby, an English naturalist. Another English naturalist, John Latham, apparently gave the bird the common name of Pileated Woodpecker, basing the name on the scientific name established by Linnaeus. If anyone knows of other common names for the Pileated Woodpecker, I’d enjoy hearing about them. Pileated Woodpeckers are cavity-nesting birds, and they use their large, stout bills to efficiently excavate their own nesting cavities in dead or dying trees. 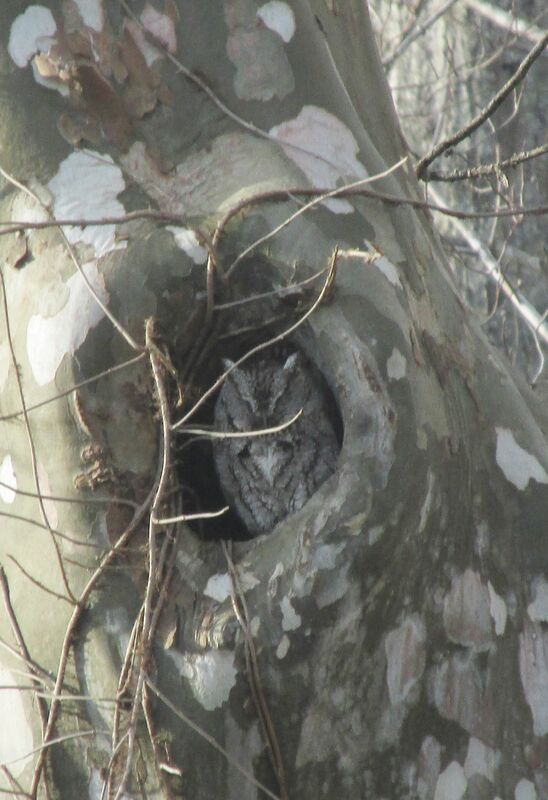 These cavities can be used in later nesting seasons by such cavity-nesting birds, such as Eastern Screech-owls and Wood Ducks, that are incapable of excavating their own nesting cavities. 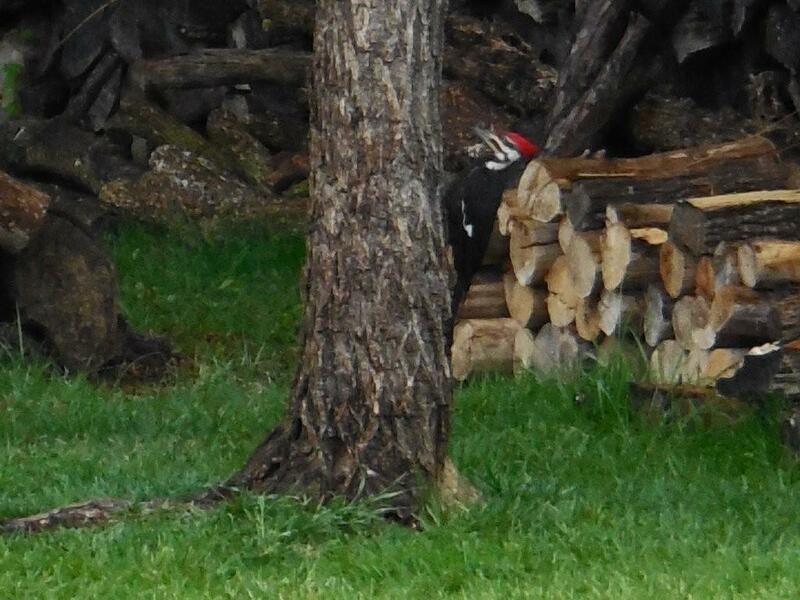 Male Pileated Woodpecker show a red whisker stripe on the side of the face that is absent in the female. Otherwise, they look similar. These large woodpeckers — they can reach a length of about 19 inches — often forage close to the ground on old stumps or fallen logs. The Pileated Woodpecker is widespread in the United States and Canada, favoring wooded areas in both countries. This woodpecker has proven adaptable, now thriving even in suburban areas offering sufficient woodland habitat. 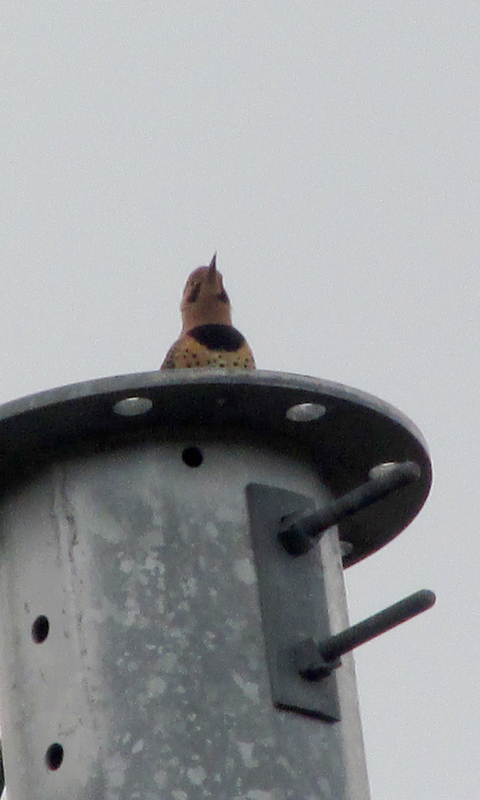 A Northern Flicker calls from atop a utility pole. Pileated Woodpecker was among the 49 species of birds found during the third of the four Saturday Bird Walks being held in October. This walk took place on Oct. 18 at Sycamore Shoals State Historic Park in Elizabethton. A total of 10 participants took part in the Saturday bird walk at Sycamore Shoals. A persistent wind made it feel cool, and we spent some of the walk enjoying sunshine that gradually gave way to overcast skies. The walk yielded observations of 49 species of birds, including quite a few surprises. A flock of 18 Great Egrets that flew over our heads, following the course of the Watauga River, was perhaps one of the more unanticipated moments. An American Coot on the Watauga River. I also enjoyed some seasonal firsts, including the first American Coot I have seen this fall. The Ring-billed Gull that soared repeatedly overhead was also a first autumn observation. Both coots and gulls spend the winter months at area lakes, rivers and, quite often, parking lots. The winter of 2013-2014 saw a large flock of Ring-billed Gulls spending its days in the parking lot at the Elizabethton Wal-Mart. For this far into October, we also did fairly well with warblers, finding five species — Tennessee, Chestnut-sided, Northern Parula, Yellow-rumped and Palm — during the walk along the park’s trails. 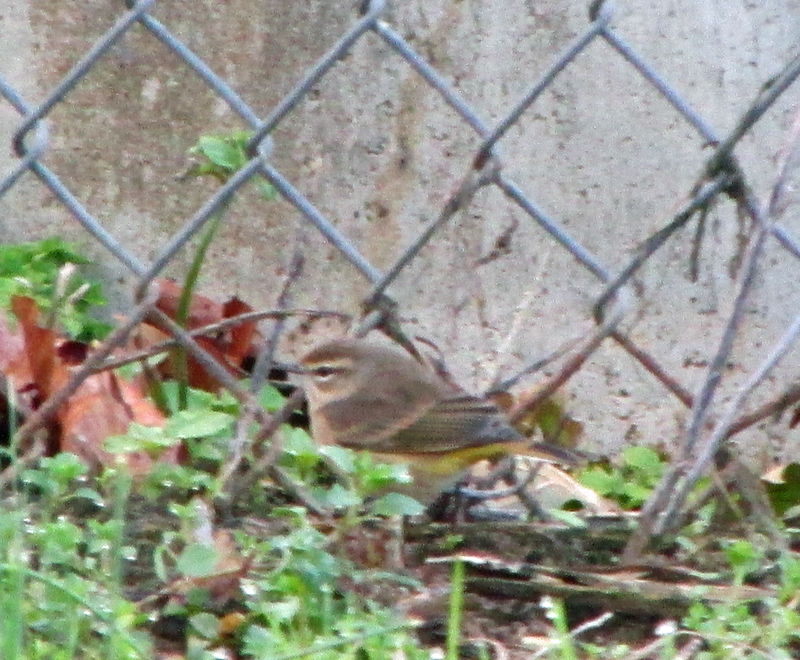 A Palm Warbler forages along a chain-link fence. In addition to Pileated Woodpecker, other woodpeckers found during the walk included Red-bellied Woodpecker, Downy Woodpecker, Northern Flicker and Yellow-bellied Sapsucker. Other species found included Canada Goose, Mallard, Pied-billed Grebe, Great Blue Heron, Black Vulture, Turkey Vulture, Cooper’s Hawk, Red-tailed Hawk, American Kestrel, Killdeer, Mourning Dove, Chimney Swift, Belted Kingfisher, Eastern Phoebe, Blue-headed Vireo, Blue Jay, American Crow, Carolina Chickadee, Tufted Titmouse, White-breasted Nuthatch, Carolina Wren, Eastern Bluebird, American Robin, Gray Catbird, Northern Mockingbird, Brown Thrasher, European Starling, Cedar Waxwing, Eastern Towhee, Chipping Sparrow, Field Sparrow, Song Sparrow, Northern Cardinal, Common Grackle, House Finch and American Goldfinch. The last of the planned October Saturday bird walks will begin at 8 a.m. from the parking lot at Sycamore Shoals State Historic Park on Oct. 26. The public is welcome. Bring binoculars to increase your viewing enjoyment. For more information, email ahoodedwarbler@aol.com or call the park at 543-5808. Readers are welcome to follow me on Facebook at https://www.facebook.com/ahoodedwarbler. 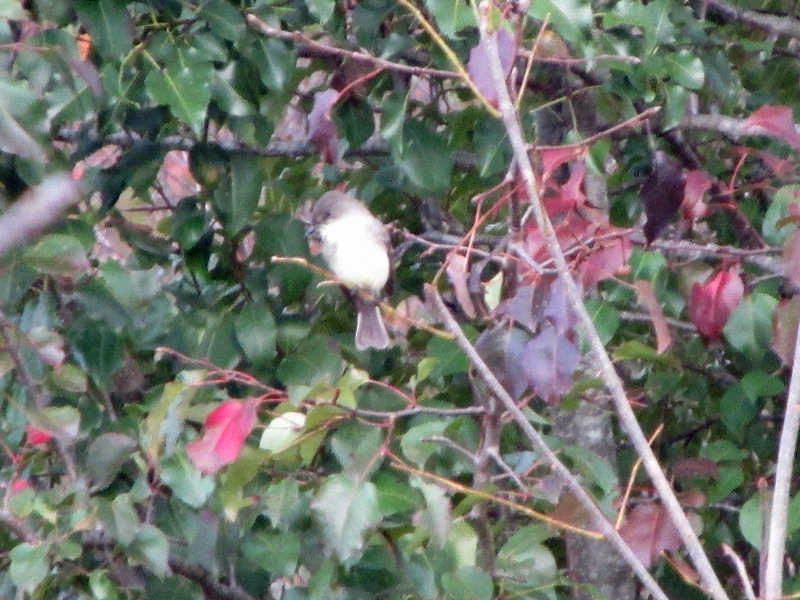 An Eastern Phoebe perches in a sapling. This entry was posted in Birding and tagged Albino American Robin, Albino Brewer's Blackbird, Carl Linnaeu, Carter County Compass, Dryocopus pileatus, Elizabethton Star, Pileated Woodpecker on October 19, 2014 by Bryan Stevens. 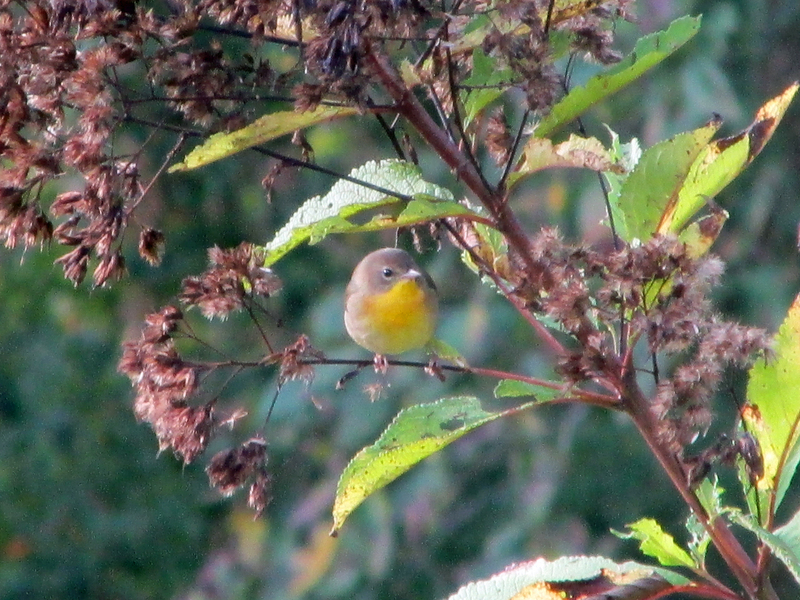 A male Common Yellowthroat was one of 24 species of warblers found on this year’s Fall Bird Count. The 45th consecutive Fall Bird Count was held on Saturday, Sept. 27 with 32 observers in eight parties covering Carter County and parts of adjacent counties, including Unicoi, Washington, Sullivan and Johnson. The annual count is conducted by members of the Lee and Lois Herndon Chapter of Tennessee Ornithological Society, also known as the Elizabethton Bird Club. 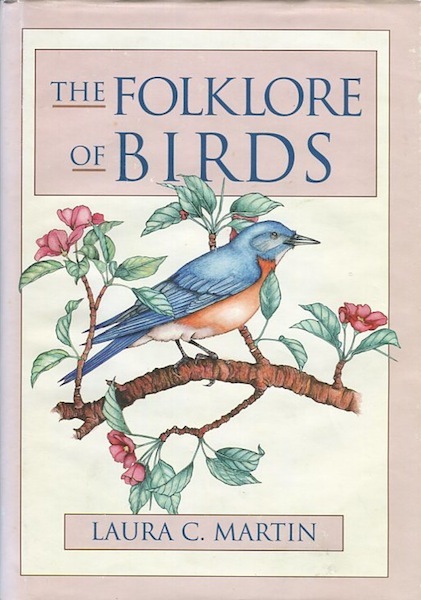 Rick Knight, long-time compiler for the count, reported a total of 128 species was found, slightly above the average of 125 species over the last 30 years. He noted that the all-time high on this count was 137 species in 1993. The total included 23 species of warblers, compared to an average of 22 warbler species for the last 20 years. The number of warbler species on this count has ranged from a low of 16 species to a high of 27 over the years. 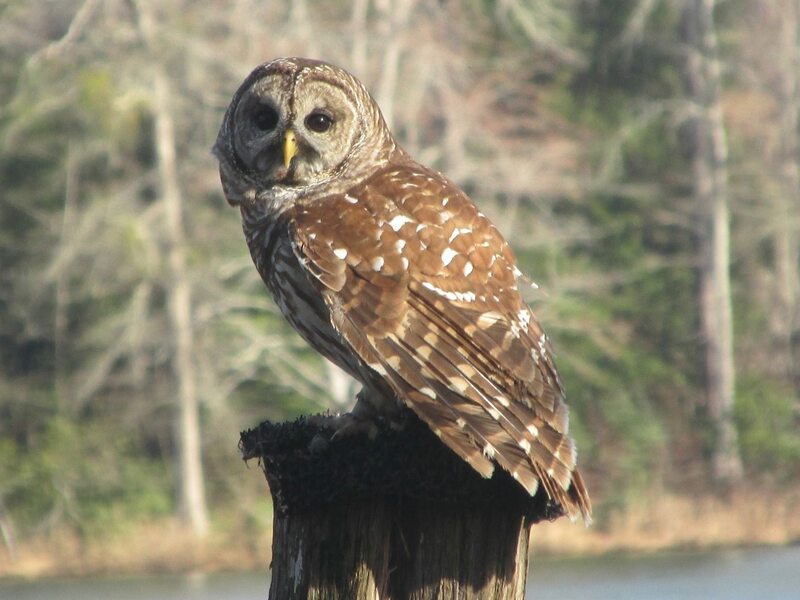 Several finds reported from Unicoi County were considered quite exceptional, including Northern Saw-whet Owls on Unaka Mountain and a Double-crested Cormorant on one of the ponds along the linear walking trail near McDonalds in Erwin. Photo by U.S. Fish and Wildlife Service A Red-necked Phalarope was a big surprise for this year’s fall count. New for a fall count were Common Merganser, Red-necked Phalarope and Eastern Whip-poor-will, with one individual of each of these species being found. 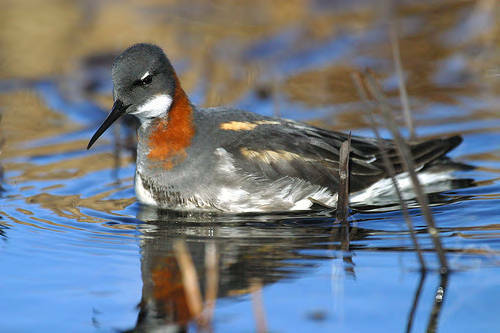 The Red-necked Phalarope represented only the seventh record for the five-county area of northeast Tennessee. 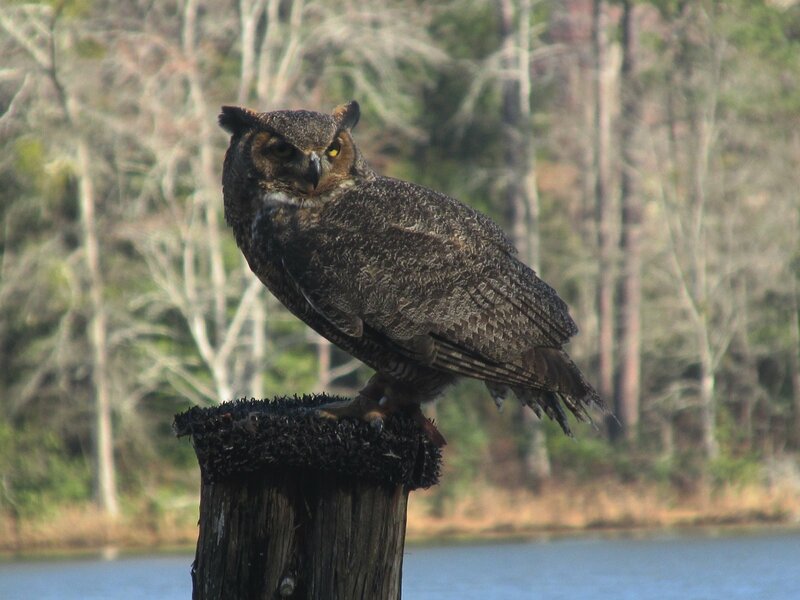 This bird, found at Paddlecreek Pond in Sullivan County, was found thanks to a timely report from participants on a Bristol Bird Club field trips. New high counts were tallied for Osprey (22) and Eastern Phoebe (76). Other notable sightings included: Bald Eagle, American Woodcock, Caspian Tern, Northern Saw-whet Owl – 2 (which has been found eight of the last 10 years), Red-headed Woodpecker, Yellow-bellied Sapsucker, Merlin, Peregrine Falcon, Philadelphia Vireo, Common Raven, Marsh Wren, Gray-cheeked Thrush, Hermit Thrush, Orange-crowned Warbler, Lincoln’s Sparrow, Summer Tanager and Bobolink. I counted in Elizabethton and on Holston Mountain with Gary Wallace and Brookie and Jean Potter. During the morning hours, while birding with Jean Potter along the Watauga River, we ran into some other birders – Nick Lorch, Bambi Fincher and Sherry Quillen – and invited them to spend some time birding with us. Later, Jean and I met Gary and Brookie for lunch at the Watauga Lake Overlook. Afterwards, we spent most of the afternoon on Holston Mountain. Finding birds during some of the hottest hours of the day on Holston Mountain proved a challenge. When birds got too scarce, we enjoyed looking at fall wildflowers, such as Bottled Gentian. 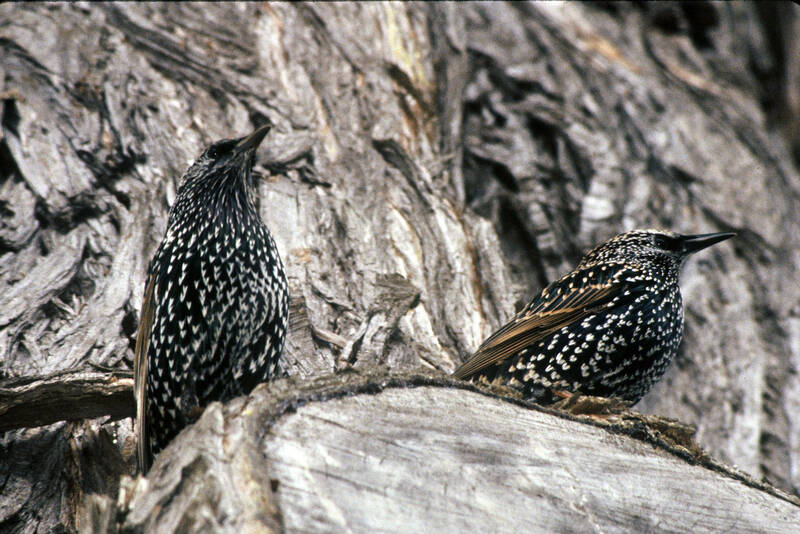 Some birds were found in large numbers, including European Starling, the most common bird on the count with 2,109 individuals tallied. Other common birds included Canada Goose (868), Chimney Swift (654), American Robin (554), American Crow (530), Tree Swallow (428), Blue Jay (353) and American Goldfinch (293). Canada Goose, 868; Wood Duck, 36; Mallard, 290; Blue-winged Teal, 12; and Common Merganser, 1. Wild Turkey, 97; Pied-billed Grebe, 4; Double-crested Cormorant, 15; Great Blue Heron, 41; Great Egret, 1; Green Heron, 4; Black Vulture, 40; and Turkey Vulture, 148. Osprey, 22; Bald Eagle, 4; Sharp-shinned Hawk, 4; Cooper’s Hawk, 9; Red-tailed Hawk, 21; American Kestrel, 6; Merlin, 2; and Peregrine Falcon, 1. Killdeer, 63; Spotted Sandpiper, 1; Solitary Sandpiper, 1; Red-necked Phalarope, 1; American Woodcock, 1; and Caspian Tern, 6. 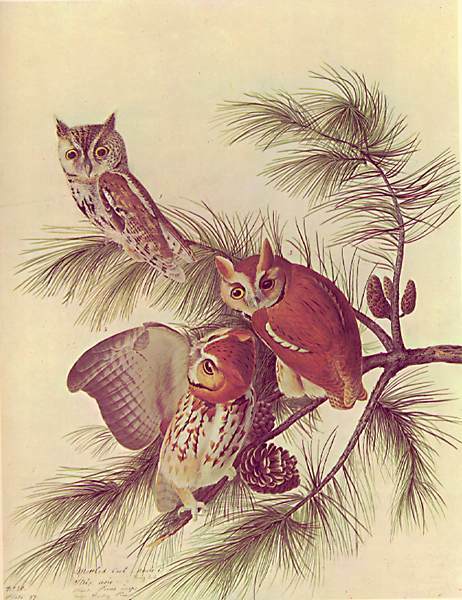 Rock Pigeon, 233; Eurasian Collared-Dove, 1; Mourning Dove, 255; Yellow-billed Cuckoo, 1; Eastern Screech-Owl, 26; Great Horned Owl, 10; Barred Owl, 6; and Northern Saw-whet Owl, 2. 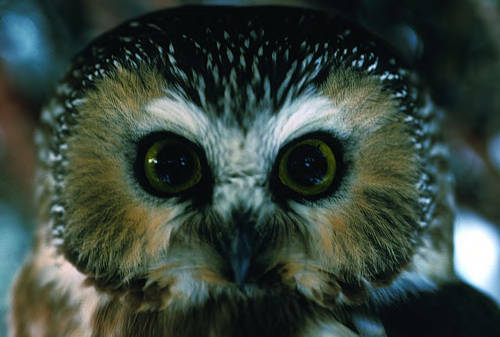 Nothern Saw-whet Owl appeared on this year’s count, as the species has done for eight of the past 10 years. 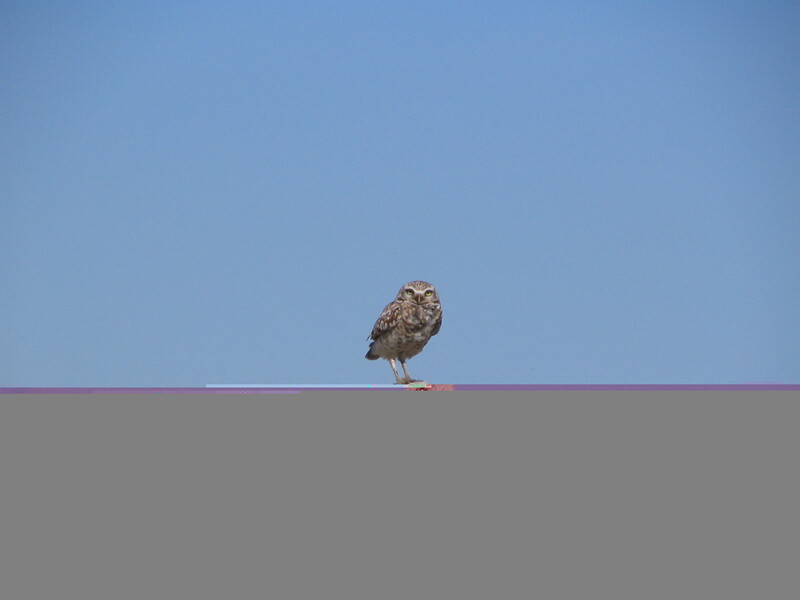 Common Nighthawk, 3; Eastern Whip-poor-will, 1; Chimney Swift, 654; Ruby-throated Hummingbird, 21; and Belted Kingfisher, 32. Red-headed Woodpecker, 2; Red-bellied Woodpecker, 65; Yellow-bellied Sapsucker, 9; Downy Woodpecker, 43; Hairy Woodpecker, 9; Northern Flicker, 56; and Pileated Woodpecker, 27. Eastern Wood-Pewee, 17; Acadian Flycatcher, 1; Eastern Phoebe, 76; Great Crested Flycatcher, 2; and unidentified Empidonax species, 2. White-eyed Vireo, 5; Yellow-throated Vireo, 5; Blue-headed Vireo, 25; Philadelphia Vireo, 4; Red-eyed Vireo, 6; Blue Jay, 353; American Crow, 530; and Common Raven, 28. Tree Swallow, 428; Carolina Chickadee, 162; Tufted Titmouse, 89; Red-breasted Nuthatch, 2; and White-breasted Nuthatch, 46. Carolina Wren, 191; House Wren, 10; Winter Wren, 2; Marsh Wren, 3; Blue-gray Gnatcatcher, 1; Golden-crowned Kinglet, 7; and Ruby-crowned Kinglet, 2. Eastern Bluebird, 122; Veery, 2; Gray-cheeked Thrush, 6; Swainson’s Thrush, 29; Hermit Thrush, 2; Wood Thrush, 11; and American Robin, 554. Gray Catbird, 59; Northern Mockingbird, 67; Brown Thrasher, 18; European Starling, 2,109; and Cedar Waxwing, 157. Photo by Bryan Stevens The Yellow-throated Warbler was one of 24 warbler species that made this year’s fall count. Ovenbird, 5; Worm-eating Warbler, 1; Northern Waterthrush, 1; Black-and-white Warbler, 8; Tennessee Warbler, 47; Orange-crowned Warbler, 1; Common Yellowthroat, 25; Hooded Warbler, 9; American Redstart, 21; Cape May Warbler, 10; Northern Parula, 4; Magnolia Warbler, 29; Bay-breasted Warbler, 4; Blackburnian Warbler, 2; Chestnut-sided Warbler, 3; Black-throated Blue Warbler, 10; Palm Warbler, 56; Pine Warbler, 6; Yellow-rumped Warbler, 1; Yellow-throated Warbler, 2; Prairie Warbler, 2; Black-throated Green Warbler, 10; and Canada Warbler, 1. Eastern Towhee, 66; Chipping Sparrow, 19; Field Sparrow, 32; Savannah Sparrow, 5; Song Sparrow, 197; Lincoln’s Sparrow, 3; Swamp Sparrow, 2; and Dark-eyed Junco, 57. Summer Tanager, 1; Scarlet Tanager, 6; Northern Cardinal, 165; Rose-breasted Grosbeak, 67; and Indigo Bunting, 14. Bobolink, 1; Red-winged Blackbird, 9; Eastern Meadowlark, 22; Common Grackle, 4; Brown-headed Cowbird, 2; House Finch, 68; American Goldfinch, 293; and House Sparrow, 54. I have been making a habit of strolling the linear trail in Erwin, especially the section of the trail located near McDonald’s. It’s always a good place to find birds such as Great Blue Herons and Belted Kingfishers. During migration, it has also been a good place to find birds such as Northern Waterthrush and Rose-breasted Grosbeak. During the month of October, readers are also invited to meet me every Saturday at 8 a.m. in the parking lot at the visitors center at Sycamore Shoals State Historic Park in Elizabethton for a bird walk along the park’s trails. The adjacent Watauga River also provides an opportunity to look for waterfowl and other birds affiliated with water. Photo by Bryan Stevens Some of the 104 Blue-winged Teal found Oct. 4 during the first of this year’s October Bird Walks at Sycamore Shoals State Historic Park. The first of the walks, held on Oct. 4, was attended by nine participants. A total of 33 species was tallied during the two-hour walk along the park’s trails. Some highlights included a raft of 104 Blue-winged Teal on the Watauga River. Other waterfowl included Pied-billed Grebes, Wood Ducks and Mallards. 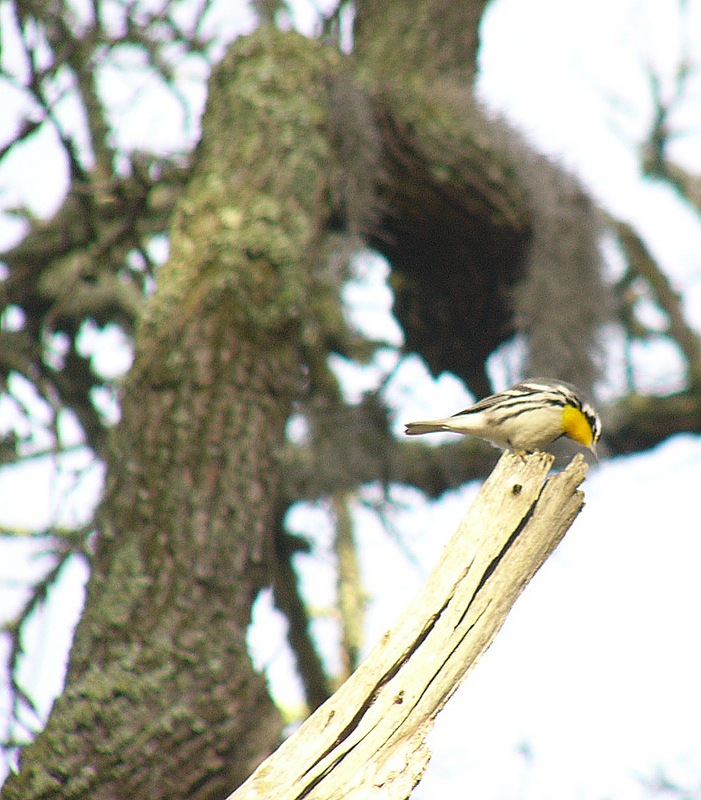 Two warblers — Common Yellowthroat and Magnolia Warbler — were also observed, as well as Swainson’s Thrush, Rose-breasted Grosbeak and Indigo Bunting. Three more walks are scheduled for Oct. 11, Oct. 18 and Oct. 25. 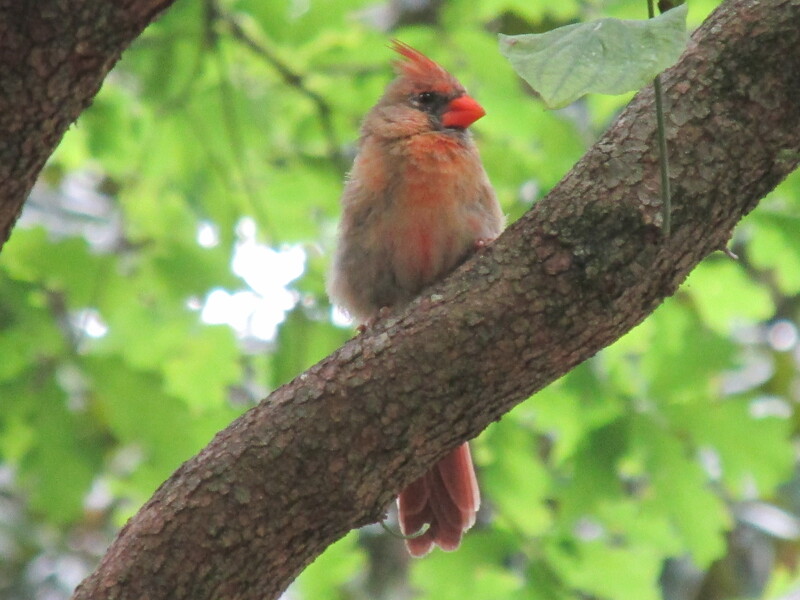 Photo by Bryan Stevens Attend one of this year’s Saturday Bird Walks at Sycamore Shoals State Historic Park in Elizabethton to look for migrating birds, as well as year-round residents like this female Northern Cardinal. This entry was posted in Birding, Birds and tagged Carter County Compass, Elizabethton Star, Fall Bird Count, Migrants, Sycamore Shoals State Historic Park on October 5, 2014 by Bryan Stevens.